What is that, you may ask? Kickstarter is a crowd-funding platform designed to raise awareness and funds for anything from media like albums and books, to new inventions that need capital to get off the ground. For me, Kickstarter is a way to drum up some interest in what I think is a great book. And since it was a Finalist in the 2014 Claymore Awards, a few others think so too. In fact, the beta readers I sent it to for opinions and insight said it was the best thing I’d ever written! Of course, this pissed some of my other books, but they’ll have to get over it. For the past few months I’ve been working on the book and its associated marketing materials, researching avenues for everything from “cool rewards” to how to sell the thing. Kickstarter is just one piece in that vast puzzle. 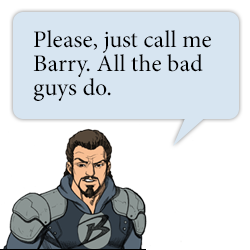 Tonight I’ve released my first Barry book trailer (it’s Trailer #2, but I did it first … don’t ask). There are two more trailers planned, #1 and #3 … so stay tuned for those. Each one will share the “world of Barry” in a different way. Oh, also … Barry vs The Apocalypse will be released in trade paperback AND hardcover! I’m so excited. I hope you are too. Mosey on over to the website to learn more … BARRYvs.com. The Kickstarter will begin in a few weeks and run for 30 days with the book releasing on April 1 (earlier for my Kickstarter backers!) … but for now, enjoy the trailer.